We're happy that Tableware Today asked Bridge founder Jason Solarek to share his thoughts about e-commerce. 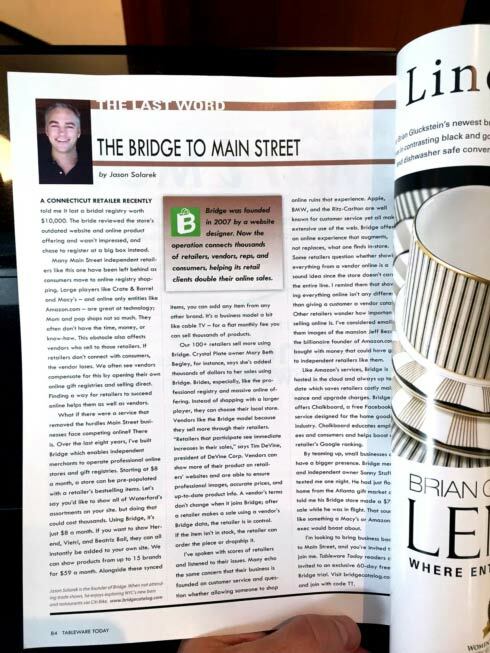 In this month's Last Word column, you can read about e-commerce trends that independent, Main Street stores are facing. Jason also shares some potential solutions. A Connecticut retailer recently told me that it lost a bride's registry worth $10,000. The bride reviewed the store's outdated website and online product offering and wasn't impressed. She chose to register at a big box instead. Many Main Street independent retailers like this one have been left behind as consumers move to online registry shopping. Large players like Crate & Barrel and Macy's – and online only entities like Amazon.com – are great at technology; Mom and pop shops not so much. They often don't have the time, money, or know-how. This obstacle also affects vendors who sell to those retailers. If retailers don't connect with consumers, the vendor loses. We often see vendors compensate for this by opening their own online gift registries and selling direct. Finding a way for retailers to succeed online helps them as well as vendors. What if there were a service that removed the hurdles Main Street businesses face competing online? There is. Over the last eight years, I've built Bridge -- a service which enables independent merchants to operate professional online stores and gift registries. For free, an online store can be pre-populated with a retailer's best-selling items. Let's say you'd like to show all of Waterford's assortments on your site but doing that could cost thousands. Using Bridge, it's free. If you want to show Herend, Vietri, and Beatriz Ball, they can all instantly be added to your own site. We can show products from up to 10 brands for $59 a month. Alongside these synced items, you can add any item from any other brand. It's a business model a bit like cable TV – for a flat monthly fee you can sell thousands of products. Our 100+ retailers sell more using Bridge. Crystal Plate owner Mary Beth Begley, for instance, says she's added thousands of dollars to her sales using Bridge. Brides, especially, like the professional registry and massive online offering. Instead of shopping with a larger player, they can choose their local store. Vendors like the Bridge model because they sell more through their retailers. "Retailers that participate see immediate increases in their sales," says Tim DeVine, president of DeVine Corp Vendors can show more of their product on retailers' websites and are able to ensure professional images, accurate prices, and up-to-date product info. A vendor's terms don't change when it joins Bridge; after a retailer makes a sale using a vendor's Bridge data, the retailer is in control. [call out] Bridge was founded in 2007 by a website designer. Now the operation connects thousands of retailers, vendors, reps, and consumers, helping its retail clients double their online sales. If the item isn't in stock, the retailer can order the piece or drop-ship it. I've spoken with scores of retailers and listened to their issues. Many echo the same concern that their business is founded on customer service and question whether allowing someone to shop online ruins that experience. BMW, Apple, and the Ritz-Carlton are well known for customer service yet they all make extensive use of the web. Bridge offers an online experience that augments, not replaces, what one finds in-store. Some retailers question whether showing everything from a vendor online is a sound idea since the store doesn't carry the entire line. I remind them that showing everything online isn't any different then giving a customer a vendor catalog in the store. Other retailers wonder how important selling online is. I've considered emailing them images of the mansion Jeff Bezos, the billionaire founder of Amazon.com, bought with money that could have gone to independent retailers like them. Like Amazon's services, Bridge is hosted in the cloud and our software is always up to date which saves retailers costly maintenance and upgrade charges. Bridge also offers Chalkboard, a free Facebook-like service designed for the home goods industry. Chalkboard educates employees and consumers and helps boost a retailer's Google ranking. By teaming up, small businesses can have a bigger presence. Sonny Stafford, Bridge member and independent owner, texted me one night. He had just flown home from the Atlanta gift market and told me that his Bridge store made a $700 sale while he was in flight. That sounds like something a Macy's or Amazon exec would boast about. I'm looking to bring business back to Main Street and you're invited to join me. Tableware Today readers are invited to an exclusive free Bridge trial. Visit bridgecatalog.com and join with code TT. Please note: this article was updated on December 8th, 2016 to reflect current pricing.